The performance is not very promising, specially the SD card interface to the Omap4 processor. We managed to setup the three environments we use to develop: openFrameworks, Processing and PureData. With oF the board reached 4-5 fps analyzyng blobs from a webcam at 320x240@30; however, without rendering the images on screen, the same analysis can reach 17fps. p.s.. great openframeworks plus kinect video. The board comes withoud OS. You have to buy your SD card and install Maverick, Gentoo, Android (remotelly), or your prefered Linux flavour. The easiest is to follow the instructions in pandaboard.org to setup a preinstalled Maverick binary in your SD card. 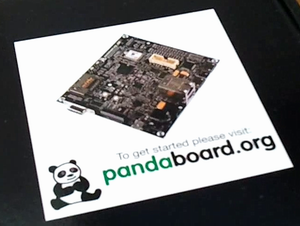 The Ubuntu Pandaboard project needs some improvements. There is a bug that limits the 1Gb onboard RAM to about just 700Mb. There is also a problem that makes the SD card transfer speed slow down. The video speed is ok, we didn't test the FullHD capabilitied yet. However, once you set everything up, I think it is the best price/performance low power development platform in the market. And I'm sure the community around the project will solve all the issues soon. Did you make any special thing to install pure data extended in Pandaboard? Just installed Pd, and got problems with ALSA sound, it says "audio I/O stuck"
Do i need to do a configuration to get it working? Any clues? Hmmm... unfortunatelly I haven't work with the Pandaboard for a while. There is much more info in the net related to Beagleboard than to Pandaboard, but the solutions to similar issues might be the same for both platforms. Google for "puredata beagleboard alsa". Sorry not to be more helpful. If you find a solution to your problem please share it somewhere.